2015 James Beard Foundation Book Award Winner for Focus on Health Discover the delicious science behind healthy cooking Too often, home cooks with good intentions sacrifice flavor and texture in an attempt to make their favorite recipes healthier. 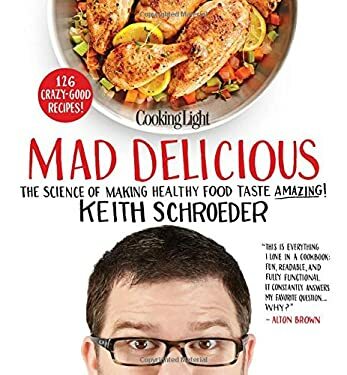 Mad Delicious shows readers how to maximize flavor and texture through 120 new recipes, witty and funny narrative, insight on the nature of ingredients, and a fresh, innovative perspective on the science of cooking with illustrated explanations. The results are mad delicious "Mad Delicious" takes the kitchen science genre to the next level: It's not just about chemistry and molecules. Schroeder teaches home cooks about the nature of ingredients, how to maximize texture and flavor with clever cooking techniques (try steaming beef-then soaking it in wine sauce for the most tender steak ever ), smooth moves in the kitchen for better work flow, and how all the sciences-geography, meteorology, chemistry, physics, botany, biology, even human sociology and anthropology-can help home cooks master the science of light cooking. Every recipe is a fun adventure in the kitchen resulting in mad delicious eats: Learn how to cook pasta like risotto for a silky sauce and enjoy Toasted Penne with Chicken Sausage. Other recipes include Lower East Side Brisket, Fish Sticks , Cocoa-Crusted New York Strip, Georgia Peanut Fried Chicken, Red Sauce Joint Hero Sandwiches, Spicy Crab Fried Rice, Tandoori Chicken, and Bourbon Steamed Peaches.